China currently has 7 official national holidays. There were major changes made to Chinese public holidays in 2008. The Labor Day golden week was abandoned and replaced by the three new holidays named Qingming festival, Duanwu festival and Mid-Autumn festival. A characteristic of Chinese holidays is that holidays that fall on a weekend are usually swapped with the closest weekday so that there can be a longer period of celebration. Like all other country's national holidays, those of the Chinese often represent their unique culture and heritage. It's good to be aware of these holidays if you plan to travel to China so that you can plan appropriately. This is the start of a new Gregorian calendar and is a day for reflection and relaxation in China. However, keep in mind that this is not a particularly festive time of the year as it is in the western world since the Chinese celebrate New Year according to their own lunar calendar. Starting with the Chinese New Year, as this celebration kicks off the events and festivals in China, you will actually find this referred to as the Spring Festival in China itself. This is the longest and most important holiday in the country and you will find that different regions have their own individual ways of celebrating this important holiday. There are several elements that are consistent across the country though, so you will get to experience these wherever you are visiting. Like Christmas and the New Year in the Western world, the Chinese New Year is a time for families and friends to get together to eat meals, and exchange gifts. The tradition of giving red envelopes (hongbao) is very common, and inside these red envelopes are monetary gifts. Homes, stores, streets and offices are decorated with duilian which are lines of poetry that wish good fortune and health on those who pass by. 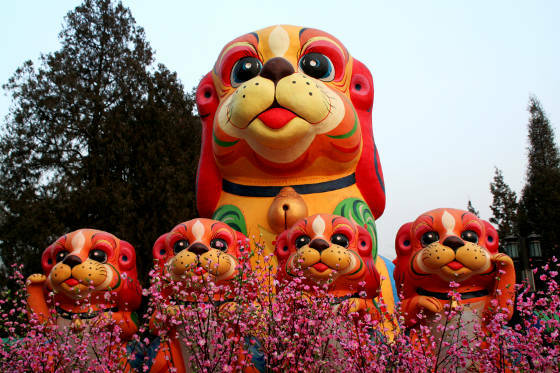 The parades that include dragon dances or lion dances are the most revered by tourists coming to visit China as these dragons and lions are a very strong part of the identity of the Chinese. Fireworks are also in abundance, and, in all, the celebrations cover a period of two weeks, culminating with the Lantern Festival on the fifteenth day. Thousands of lanterns illuminated in the night makes this a very beautiful and moving event to witness. This festival falls on the fifth solar term of the Chinese lunar calendar and generally takes place on either the 4th or 5th of April on the Gregorian calendar. This is a day to remember and honor ancestors at grave sites. Tombs are swept and gifts are offered to these ancestors in the form of tea, food, wine and more. Willow branches are sometimes carried or put up outside homes to fend off the evil spirit wanderer of Qingming. During Qingming, people also go on outings with their families, sing, dance and enjoy the outdoors. Couples begin to court and traditionally kites are flown in the shape of characters from the Chinese opera. Labor Day was initially a three-day holiday in China; however, it was reduced to a one-day holiday in 2008. Like other countries, Labor Day in China celebrates the work of the general labor movement. China's Dragon Boat Festival is another of the more famous festivals celebrated here, largely because dragon boat festivals have become popular in the Western world too. Officially known as Duanwu in China, and also sometimes as the "Double Fifth", this festival takes place on the fifth day of the fifth month of the lunar calendar. The Dragon Boat Festival is thought to be an ancient festival in China, though its origins are debated, with different traditions preferred in differing regions of the country. The most popular theory is that the festival commemorates the death of the poet Qu Yuan. The local people of the ancient state of Chu dropped sticky rice triangles that were wrapped in bamboo leaves into the river so that they would feed Qu Yuan in the afterlife, and then they paddled out in boats to scare away the fish. It's the paddling in boats that is thought to have given birth to the dragon boat festival. If you're coming to China to experience the Dragon Boat Festival, the highlight is probably going to be the dragon boat racing, but the festival also includes the preparation and eating of some very tasty foods and drinks, along with some ancient rituals that are said to promote health and wellbeing. The date of the Dragon Boat Festival changes each year, plus festivities can take place at different times in different cities. Known also as the moon and lantern festival, this holiday is held during a full moon on the fifteenth day of the eighth month in the Chinese calendar (generally September or early October). This is a day to gather families and/or crops, give thanks for unions/harvests and praying for babies, a spouse, longevity, beauty and other similar things. This day celebrates China's day of independence. Government-organized events such as concerts and massive firework shows are hallmarks of the celebration on this day. Places of public significance are decorated and portraits of past leaders are displayed. Click here to apply for an expedited visa for China.